In order to better track and monitor ITS-related problems, please send all requests for assistance, problems, or other issues to techline@wartburg.edu and not to a specific ITS individual nor to helpdesk@wartburg.edu. Requests sent to techline@wartburg.edu are automatically entered in our new ticketing system. Once your request is in the ticketing system, we will be better able to monitor progress and you will receive improved follow-up communication. The Juice will take a break after the Dec. 17 edition and resume Jan. 7. Send in your items by 4 p.m. Thursday before Monday publication. Dec. 10-14: Open normal hours 9 a.m. to 4:30 p.m.
Dec. 17-21: Open abbreviated hours 9 a.m. to 4 p.m. For holiday shipping deadlines, contact the Mail Center. Campus delivery runs will take place late morning. Dec. 22-Jan. 1: Closed from Dec. 22 to Jan. 1. 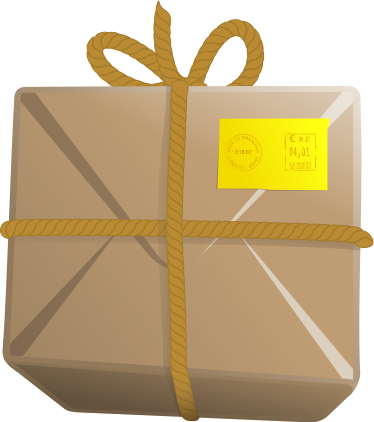 Mail and packages addressed to Wartburg College during closure will be processed and held until we reopen at 9 a.m. Jan. 2. Mail will not be forwarded to student home addresses over Christmas Break. Jan. 2-4: Open abbreviated hours 9 a.m. to 4 p.m. Timing of campus delivery runs will be dictated by volume. Please contact mailroom@wartburg.edu with questions. The notes from the Dec. 4 Presidential Forum are posted under President’s Reports on the InfoCenter. The winter State of the College address will be Jan. 29, 2019, 11:30 a.m.–12:30 p.m. in McCaskey Lyceum. Please remind students that an incomplete grade is not valid unless it is supported by a Student Request for Incomplete Grade Form. The completion of the form should be initiated by the student to confirm that the student and instructor have been in communication regarding the incomplete grade policy. The form is available on My Wartburg or in the Registrar’s Office. Any incomplete grade submitted by the instructor without support of the form will be changed to any “F.” Please refer students to the incomplete grade definition in the 2018-19 academic catalog, which can be accessed online. Incomplete grades should only be issued for students who are passing the course when final grades are due. With permission from the Registrar, instructors can complete the form for a student whose circumstances prevent them from submitting the form. Student Life announces the launch of St. Elizabeth’s Bread Basket, an on-campus food pantry for students who find themselves food-insecure over college breaks. Located in Student Life, St. Elizabeth’s Bread Basket provides non-perishable food items at no cost to students who remain on campus when dining options are closed. The pantry will be open during regular office hours Dec. 17-21, and other times by contacting Security. Thanks to Redeemer Lutheran Church, the Northeast Iowa Food Bank and Dr. Tammy Faux for the generous donation of non-perishable food items. Please see Jennifer Onuigbo in Student Life for more information. While cleaning up and clearing out, consider donating your unwanted items worthy of being rehomed to the donation station bins. Located in a designated lobby of each residential hall, we will collect non-perishable food and winter coats to be shared with the international students on campus, as well as school supplies and dorm living items that will be placed in the free on-campus REUSED Store. Other items will be donated to the local Trinkets and Togs store. This program diverts unnecessary waste from landfills while also connecting desired resources to our campus community. Volunteers are needed for Unified Sports Day on Saturday, Feb. 9, from 8:50 a.m. to 12:15 p.m. You will spend time with Special Olympic Athletes participating in activities such as basketball, volleyball, crafts, and more. This is a great way to give back to the community, and it’s a lot of fun! Sign-up will be in the Saemann Student Center during lunch and dinner hours Jan. 8 and Jan. 11, or through this link. Registration closes Jan. 15. Email nicole.adair@wartburg.edu with any questions. Dining Services will sell bakery items to take with you over Christmas Break. Items may be ordered through your GET account until noon Thursday, Dec. 13. Gluten-free options are available. If you have questions, contact the Dining Office at 352-8303. The Davis Projects for Peace, in its 12th year, is an invitation to undergraduates at American colleges and universities in the Davis United World College Scholars Program to design grassroots projects that they will implement during the summer of 2019. The projects judged to be the most promising and feasible will be funded at $10,000 each. The objective is to encourage and support today's motivated youth to create and try out their own ideas for building peace. Wartburg students must submit their application using the following link by noon Jan. 14, 2019, at this link. Not sure if you are ready to launch a Davis Projects for Peace idea? Try submitting to the Wartburg College Wicked Problems Challenge at this link or submit an application for a TEDx talk at this link. Do you shop on Amazon? If you set Wartburg as your nonprofit of choice and access Amazon Smile, Amazon will donate a portion of your spending to Wartburg College! If you're an Amazon user, this simple change is a wonderful way you can provide for students at Wartburg. 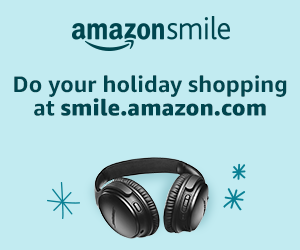 Click here to learn more about Amazon Smile. Please click here to download a list of the hours for the campus dining areas over Christmas Break. Mensa will be closed Dec. 14-Jan. 5. The Den and Konditorei will be closed Dec. 15-16, Dec. 22-Jan. 1 and Jan. 5. Additionally, the Konditorei will be closed Jan. 6. Students, faculty and staff are asked to share their favorite recipes from home to be considered for the 2019-20 Mensa menu! Recipes for entrees, salads, ethnic dishes, vegan entrees or sides and desserts can be emailed to Shelly Geweke by Friday, Jan. 31. Don’t forget to include your name and contact information for verification. Recipes chosen will be taste-tested in Mensa and the student body will vote for their favorites. Dishes that receive a “thumbs-up” will be considered for next year’s Mensa menu. Have you always wanted to give a TEDx talk? 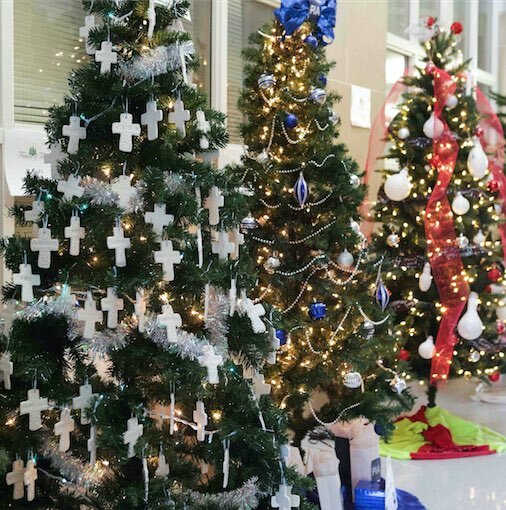 The annual Wartburg-Waverly Festival of Trees will brighten the halls of the Classroom Technology Center through Dec. 12. A partnership between the college and the Waverly Chamber of Commerce, the festival is open daily from 9 a.m. to 9 p.m. and attracts more than 5,000 guests each year. The Wartburg Alumni Citation recognizes contributions and support to the college, vocational and professional achievements, and community and/or church leadership. Lois Volkmann Jelneck ’50, Judith Slade McCaskey ’65, and Michael Sinram ’75 received the honor at Homecoming. Nominations for the 2019 awards and a list of recipients can be found here. The deadline for submissions is Feb. 1. There will be no Weekday Chapel services this week due to Finals Week. Enjoy your Christmas Break! Amy Moorman, college archivist, recently presented at two professional conferences. On Nov. 9, she delivered a talk titled “Building an Online Media Library for the Archives of Iowa Broadcasting” at the Upper Midwest Digital Collections Conference in St. Paul, Minn. On Nov. 30, she was a member of the roundtable discussion “Think Nationally, Preserve Locally: Creating Sustainable Local Television Collections” at the Association of Moving Image Archivists annual conference in Portland, Ore.
Dr. Kathleen M. Goodyear, lecturer in English, presented at the International Transformative Learning Conference Nov. 7-10 in New York at Teachers College, Columbia University. She presented on her Ohio State dissertation research using arts-based identity exploration activities to foster undergraduates’ increased self-awareness and cultural sensitivity. She also co-facilitated the experiential “Storytelling for Individual and Community Perspective Transformation” session. During the past year, she served on two ITLC planning committees, Arts and Transformative Learning and the Transformative Listening Project. Drs. Caryn Riswold, Justin Jeffcoat Schedtler and Kyle Schenkewitz presented at the annual national conference of the American Academy of Religion and Society of Biblical Literature in Denver, Colo., Nov. 16-21. Drs. Chip Bouzard, Kuni Terasawa and Kristin Wendland also attended. Riswold, professor of religion and the McCoy Family Distinguished Chair in Lutheran Heritage and Mission, presented “Women's Public Voice: Connecting the Academy and the Public Through Media,” in the Lutheran Women in Theological Studies group, and “Already Freed, Christians Should Serve (Cake): Christian Privilege and Religious Freedom Claims,” in the Martin Luther and the Global Lutheran Traditions group. Schenkewitz, visiting assistant professor of religion and philosophy, presented his remarks at a roundtable session entitled, "New Chapters, Blank Spaces: Reflections on the Academy from Those Who have Left and Those Who Remain” as part of the Academic Labor and Contingent Faculty Committee.” On Nov. 18 he was inducted as coordinator of the Emerging Scholars group of the Society for the Study of Christian Spirituality and participated as a non-voting member of the board. He will encourage development and collaboration of international graduate students and early career scholars in the area of Christian spirituality. The Education Department and Education Unit faculty and students accepted into the Teacher Education Program, as well as Reading Endorsement students not admitted to the TEP, are eligible for special funding to attend the Iowa Reading Association Conference in Ames, June 25-26, 2019. Wartburg registrants may request reimbursement of expenses for registration, travel, housing, and meals, from the Institutional Advancement Office, Luthe Hall room 123. Contact Scott Leisinger at 352-8495 for information. These literacy awards are available through the generosity of Leonard and Carol Posekany, parents of Education Department emerita faculty Dr. Susan Sherwood and Dr. Peggy Pruisner. Caleb Lines ’22 won the Dr. Pepper Tuition Giveaway during the Big 10 Football championship game, as reported by the Des Moines Register, Waterloo-Cedar Falls Courier, KCRG, and WHO-TV. Ron Nichols ’11 is one of the first pharmacy residents to be mentored by Bob Greenwood, owner of Greenwood Pharmacy. The program, which was reported in the Waterloo-Cedar Falls Courier, is designed to help new pharmacists open their own independent pharmacy. Matt Sacia ’19 has repeated as the American Rivers Conference MVP, as reported by the Waterloo-Cedar Falls Courier. Itonde Kakoma ’03, programme director with the Crisis Management Initiative, moderated a discussion and panel of global leaders, including former U.S. Vice President Al Gore, about a more sustainable world for future generations. Elliott Stern ’17 is director of the Ankeny Community Chorus and a choral music instructor at Prairie Ridge Middle School, as reported by the Des Moines Register.